The Cuilcagh region has the densest distribution of glacial erratic boulders in Ireland – they are at their most dense in the Cavan Burren. Historically these boulders provided the raw material for quarrying of stones for use in buildings and walls – which usually involved splitting/breaking the boulders. However the Burren-Marlbank project observed modifications to prominent boulders which could not be explained in terms of quarrying activity. It was clear that many modifications were efforts in enhancing the natural monumental aspects of these truly spectacular features. The problem was how to work out which features were natural and which were human-made. 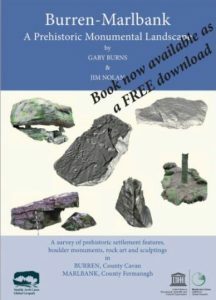 The evidence of human modification was based on a number of factors, for example the sheer number of similar features on so many different boulders, the presence of multiple modifications and the presence of Rock Art on critical examples, and most importantly, by the discovery of a large number of ‘Evidence’ boulders. There are seven significant modifications that are commonly observed on boulder monuments, quite often several modifications can be observed on the same boulder – this provides strong evidence of human intervention. 701 is a unique triangular shaped split boulder with multiple modifications. It is beside the road as you pass the entrance barrier of the Cavan Burren Park – instead of continuing to the main park stop at the very small car park at the entrance barrier – it is 200 metres further on. It is an evidence boulder as it has been split and lower section repositioned forming a direction chamber between the two boulder sections. The main section has a significant chock and has rock art on the exposed fresh face and rim grooving. The carving on the fresh face compares with the unworked face of the other section of this split boulder. It is a kerbed boulder. The monument is incorporated within a complex of settlements walls and hut sites. Hut 27 is close by. 704 is a triple split sandstone glacial erratic. It is the most multi-featured monument in Cavan Burren. The main section has a very large prop resting upon another prop, with a chamber that has been cut out of limestone pedestal. The fresh face of this section has rim grooving, corner hollows with channels. Using 3D refitting techniques the corresponding unworked section validates the anthropgenic working. The second section has also been propped with another cut chamber and cups marks on fresh face. Additional features include a kerb, stone flankers and rounded corners. It shares several features with nearby PB40. This is an evidence boulder validating sculptings as a type. An excavation in 2015 by Cummings and Richards was inconclusive. PB40 is a split sandstone glacial erratic with sculptings on fresh face of one section with other unworked section being propped. PB40 shares almost identical sculptings with 704.It is an evidence boulder thereby validating sculptings as a type.